It is important that, from the first day in school, the child is encouraged to see books and other reading material as exciting, pleasurable and interesting. All of our classrooms have a classroom library, where children are encouraged to browse and choose books that they like during their reading time. In the Junior Classes there is a large selection of picture books, flap books, pop-up books, alphabet and counting books, along with collections of nursery rhymes, verse and illustrated folk and fairy tales. As the child matures and progresses the range of reading material is extended to include a wide variety of genres. 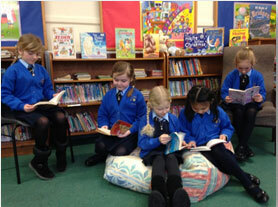 The classroom libraries also cater for all levels of interest and ability so that all children will experience success and enjoyment in reading independently.We also have a well-stocked school library containing a wide range of fiction and non-fiction to cater for a wide variety of interests. Class groups visit the library once a week to browse and choose books to take home for the week. The importance of the library in enriching the child’s reading experience cannot be over-emphasised. 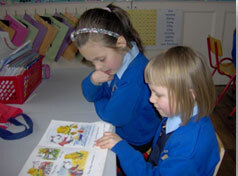 Every opportunity is taken to excite pupils’ interest in reading. Occasionally we invite authors of children’s books, poets and storytellers to the school. Our annual Book Fair also generates great interest in books as does our celebration of World Book Day.Children are also encouraged to become members of the public library, which is nearby, thereby giving themselves access to an even wider range of reading material and a valuable resource for independent reading experience.